First of all, congratulations on your recent success in the last European Shogi Championship! 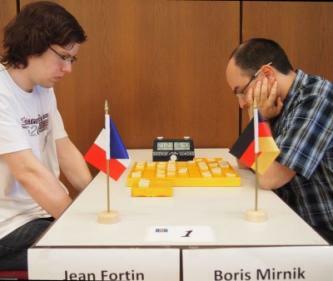 I heard that the deciding match (you against Mirnik Boris, from Germany) was really tough. What was your impression? Thank you. In the final game, my opponent decided to open the position and attack quickly, but neglected a bit his castle (defensive formation) in the process, which was what allowed me to win the game in the end. Could you please introduce Shogi to our readers who are not yet familiar with it? I heard that the two main differences between Shogi and Chess are the 'drop' rule and the tempo (it seems that Shogi is like a race over checkmate!). Is that description correct? Shogi is an old game. Like the Western Chess, it comes from the Chaturanga. As you said, the main difference with Chess is the drop rule, which allows the return of captured pieces to the board, to use them as one's own. This rule makes the endgame very different from Chess, since the number of pieces never decreases. The attacks will become almost impossible to stop, and at the end it is a race to mate the other king. This makes the game very dynamic and exciting. Is it true that Japan is the best Shogi country in the world? Definitely. In Japan, Shogi is more popular than Go or Chess. Like in Go, there is a very developed professional association. Professional players compete in major titles, the most prestigious one being the Meijin. Do you have a Shogi trainer or you study Shogi by yourself? I study by myself, by playing on the Internet, watching high level games, and reading books. It is said that to be a champion it takes desire, dedication, determination, concentration and the will to win. What do you believe to be the most important factor of them all? And is there a secret ingredient? I think the most important one is dedication. To become a champion, one needs to train, to play again and again, to reach the necessary level to fulfill one's dreams. Just so we understand where you are coming from, please tell us, if you can, where your passion for board games comes from. When were you introduced to them? I have always liked board games. I started learning chess when I was a child: I used to play with my dad. From elementary school, I started going to a chess club and participating in tournaments. When did you decide to get serious about Shogi? I started playing Shogi one day on an impulse - not really sure what I was getting into - after reading about it in the manga Hikaru no Go. The Kanji (Chinese characters) on the pieces were intimidating at first, but I really liked the dynamism of the game, and very soon I started playing a lot on the Internet. There are some countries in which chess is compulsory in schools. What do you think about that? Do you believe that it would be beneficial to introduce a board game as a mandatory school subject? I don't think a board game should be a mandatory subject. I know people who were forced to practice a game (by their family) in their childhood, it doesn't leave them with a good feeling about the game. However, I think it's good to have an introduction to a game in class, and clubs to go further. I'm very happy to have won for the third time. In the future, I hope to be able to visit Japan and the world of Shogi there, and maybe take part in some tournament. What do you like doing besides playing board games? Besides playing board games, I enjoy music (listening, and playing the guitar), reading, and many other things. Jokep (AT): 1) I often hear that Shogi is easier that Go ... can you comment on that? The rules of Go are very easy, but it's hard for a beginner to understand what the game is about, without the help of an experienced player to show the basic ideas. On the other hand, learning the rules of Shogi is a bit more complicated, since you need to learn the pieces and their movements, while the idea of the game is simple - take the king of your opponent. But I think that after the beginner stage, both games are very deep, very complex, and very interesting. 2) Also, I once read (in a text by Oskar Korschelt about Go) that it's not possible to plan ahead in Shogi as well as in Chess because of the possibility to use captured pieces as your own. What do you think about this? It is a bit more difficult to plan ahead because you have to take into account all the possible drops, but it is not impossible, far from it. For instance, experienced Shogi players will often train by solving 'tsume' problems that can be more than 20 moves long. 3) What would you recommend to a Go player who wants to learn Chess? I don't really know how to answer this, because I experienced the opposite, learning Go after playing chess. FoUw (FR): 1) Don't you get confused, playing 3 (or more) different board type games? The games are different, so there is no real confusion between them. The chess and Shogi pieces look very different, and Go is a totally different game. 2) Is it easier to play other board games when you are already used to one? What kind of advantages do you get? Chess, Go, and Shogi all feature a similar thought process to choose the best move. For a candidate move, you imagine the best answer of your opponent, then your best answer, try to evaluate the position, etc. So having already practiced one game will usually help learning other games. In addition, some concepts come back from one game to the other. The concept of 'keeping the initiative' in Go can help in Shogi, for instance. 3) How big is the Shogi community (worldwide, in Europe, in France), do you think it can grow up fast in Europe? Shogi is very developed in Japan, but it is not played a lot in the rest of the world. Big Shogi tournaments in Europe have about 100 players, which is much less than Go or Chess tournaments. Recently, the number of clubs in France have greatly increased thanks to some very active players. But it remains very minor compared to Go or Chess. 4) Is there any server to play Shogi for Europeans ? 5) What is your favorite board game? I like all board games, but nowadays I probably tend to prefer Shogi and Go over Chess. Nohei: In your opinion, what is the deepest game in term of sensations / impressions and involvement? And, maybe, in the relation with the opponent and the pawns / stones? I don't think there is a 'deepest game'. Chess, Go, and Shogi are all three very deep games. noth1ng: 1) Why Shogi is not included among 5 world mind games along with Go, Chess, checkers, bridge and xiangqi? Go, Chess, checkers, bridge are very international games. Shogi is mostly played in Japan. But it was included in some other international mind games events. 2) What is computer level in Shogi? The only match between a computer and a professional player saw the victory of the Human player. But computers are improving very fast. Breakfast: 1) Japanese Shogi pros are not allowed (by Shogi Federation) to challenge computer Shogi programs on public (to keep the face). Is it a good idea to accept the same rule in Go and chess? In chess, computers have already proven that they are as strong, or stronger, than the best human players. The same is probably inevitable in Shogi and Go in the future. I don't think that forbidding professionals to play against computers will change that. 2) What was the biggest cash prize you got in European Shogi tournament? In Europe, Shogi is played purely at an amateur level, and most tournaments (including the European Championship) don't offer any cash prizes. 3) Is it possible for you to live only by playing Shogi tournaments and teaching Shogi, or is it necessary to find other source of income? I do not think it is possible to live from Shogi in Europe. 4) What is the difference in level between you and top Japanese Shogi pros? I recently played a game against a top Japanese pro, Yoshiharu Habu, at rook handicap, and lost. The difference in level is still very big. WinPooh (RU): 1) Who is your favorite Chess player 1) in the past 2) among modern GMs? The same questions for Go and Shogi. I like a lot of players, I can't really choose favorites. One thing I can say is that I like to see chaotic and risky games, rather than slow positional play. 2) Do Shogi players use computer programs (both playing modules and databases) for training and preparations? Yes, databases are available and widely used. Aokame: 1) When did you started with Shogi and why did you stick mostly (I guess) to it? I started playing Shogi about 4 years ago. The game captivated me with its very dynamic tactics, and to understand more about it and improve fast I have been playing mostly Shogi since then. 2) Are Go and Chess helping you to improve your Shogi reading? If yes, how much? Yes, Go and Chess both help me in Shogi. As I mentioned earlier, a lot of the techniques and concepts in Go and Chess can be useful in Shogi. The opposite is also true, I know at least one player that has improved greatly in Chess after learning Shogi. 3) Can you briefly explain us joseki in Shogi? Where are the differences and are any trick plays involved? Joseki in Shogi is a bit different from Joseki in Go, because it is a whole board sequence rather than local sequences. It is more similar to the study of openings in chess. Like in Go and chess, there are some trick plays. Joseki are also constantly evolving, and some new moves are played every year. 4) How strong is the European Shogi level compared to Asia? European Shogi level is very far from the professional level of Japan. At the amateur level, the difference is not as big, but I think the strongest amateurs in Japan are still above the western players. Yoshiharu Habu is the one that comes to mind first. His playing style is very creative, very exciting, and he is the only player that held the 7 major titles at the same time. 6) Any advice in improving in the game of our choice? Keep playing, and enjoy your games! @takodori: It looks great on your site! Thanks for your work, and good luck in popularizing Shogi! Thanks for your nice acceptance. The translation has been done here. Sorry for delay in informing you. @tokin: The Ryu-oh tournament is interesting as a whole event. However, the final match is more interesting with the finale game being the most interesting. The one game in human vs computer match makes it less interesting because the weaker player can win 1 game but less likely to win a longer match. The high cost for the Ryu-oh-sen and the Mejin-sen are reasonable because they are many games between many players and these players are the strongest players. The 100 million yen fee is for the weakest player to play the computer one game. For the Mejin-sen to play the computer one game the fee is 780,000,000 yen that is more than Ryu-oh-sen and Mejin-sen combined. The JSA is saying we would rather get 0 yen then a Mejin-sen play a computer. I did not know about the game with the Meijin in 2005. Thank you for that information. There have been only three games since 2005. There should have been more games and the JSA would have profited from more games. I would rather have Hifumi Kato play than Kunio Yonenaga because Yonenaga made the rules so he should not personally profit from the rules. I think the fee for Hifumi Kato is higher at 100 million yen or more. I would not be surprised if Yonenaga says the next computer match will be with Hifumi Kato. What is the saving face? It is as embarrassing as a marathon runner losing a race to a car. @Mark Schreiber: It is incorrect to compare the 100 million and 39 million. The 100,000,000 yen fee is not a prize for a professional, it is a cost of the event. Nor is it correct to compare the number of games in the events. The Ryu-oh tournament is interesting, taken as a whole (not only the final match), while in the human vs computer opposition every separate fight attracts great interest. One Ryu-oh-sen costs sponsors 341 million yen (Mejin-sen costs 360 (+112 extra payment) million yen). So 100 million is a reasonable price for such a high-profile event as the game of human-computer. Since "the ban" imposed in 14 October 2005, there has been two top male professional (Meijin titleholder in 2005 and Ryu-Oh titleholder in 2007) and a top female player (in 2010) played a computer. Another event is expected in January 2012. Yes, the head of the association 68-year-old Kunio Yonenaga (Meijin-1994) retired in 2003, but you can't really suppose it would be another thing if, for example, 71-year-old active player Hifumi Kato (Meijin-1982) would challenge a computer? So I see the association is keeping the issue on the boil and hoping to use business potential of computer shogi. In any case the "saving face" is not the subject at issue. @tokin: The Japanese Shogi Association does not officially prohibit professional players from challenging computer Shogi programs, but for all practical purposes, they do. The JSA fees to play the computer are too high. The highest prize a professional can win is 39,000,000 yen for the Ryu-oh match. The Ryu-oh match is a series of games. The 100,000,000 yen fee is the lowest fee for a low level professional to play the computer. The fee for stronger professionals is higher. These fees are for one game. No one will pay these high fees. Since 2005 there has been only one male professional allowed to play a computer. If JSA were interested in economic benefits they would had negotiated in good faith and they would have profited because they would have earned fees from computer matches. The event in January 2012 is not with a professional Shogi player. Kunio Yonenaga, 68.5 years old, retired from being a professional Shogi player in 2003. Great advantage of shogi is handicap game. It is more interesting game, than handicap go. May I translate the interview into Japanese to publish on the net for free of charge so that lots of Japanese readers can get to know the contents of it. I'm a webmaster of http://www.shogi-isps.org/ ISPS stands for International Shogi Popularization Society.